Baggage Battles :: Show Information :: RabbitTV GO! Following the colorful personalities who make a living buying items at auctions is a favorite subject of TV producers. 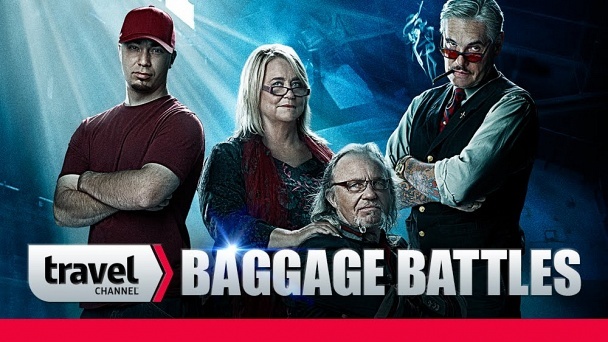 "Baggage Battles", essentially a replica of A&E Network's "Storage Wars" minus the storage units, depicts the process of "auction specialists" bidding for, buying and reselling property found in unclaimed luggage. It features three teams of bidders: Laurence and Sally Martin, who have appeared on "Storage Wars" appraising items in their California antiques store; young entrepreneur Mark Meyer, who owns a Long Island, N.Y., thrift store; and Billy Leroy, the proprietor of Billy's Antiques and Props, a famous eclectic prop and antique store in the Bowery neighborhood of Manhattan.